Researchers at the RUDN University have developed a mathematical method to solve the quantum Coulomb three-body problem for bound states with high accuracy. They also showed that previous calculations performed by a group of Japanese scientists are incorrect. The work will contribute to more accurate calculations of the trajectories of quantum particles in space, and its results will be useful in solving fundamental problems of physics. The paper was published in the journal Physical Review A. Physicists at the RUDN University have calculated how much energy is required to strip an electron from an atom, thereby turning the latter into an ion. They determined the value of this parameter for different levels in the helium atom with best known precision—up to 35 decimal digits. 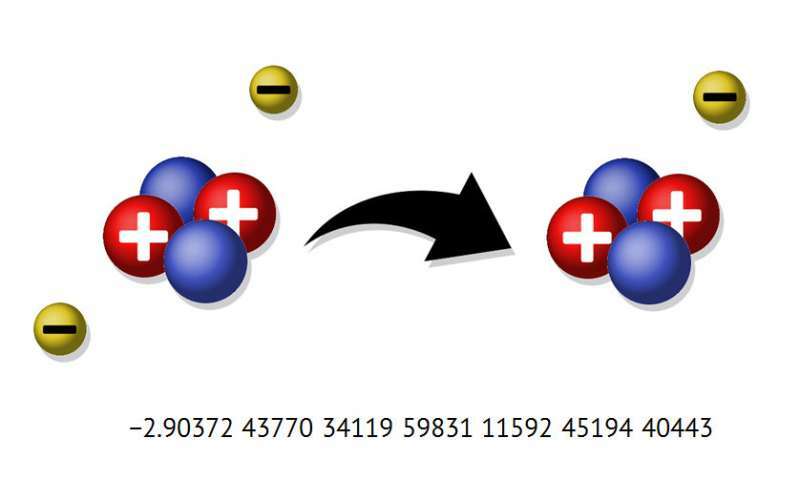 It turned out that the solutions used earlier for the hydrogen ion H−, with 40 decimal points, deviates from the value previously determined for the 35th decimal place. The scientists carried out calculations for a system of helium atoms interacting according to Coulomb's law. In the normal state, the atoms are neutral and do not interact with each other. For this to happen, it is necessary to ionize the helium atom—that is, to take an electron away from the ion. Then the atom will acquire a positive charge. This requires to get some energy (the so-called ionization energy). Its value determines the strength of the interaction of an ion with other charged particles and the trajectory of its motion in space. "We developed an approach based on the variational method, which allows one to numerically solve the quantum three-body problem bound by the Coulomb interaction, with almost arbitrary precision. This method is used to calculate the ionization energies of a helium atom for different energy levels of arbitrary orbital angular momentum. Our approach demonstrated the effectiveness and flexibility in the study of Coulombic systems. Furthermore, obtaining such values does not require the use of supercomputers," says co-author Vladimir Korobov of the Laboratory of Theoretical Physics of the Joint Institute for Nuclear Research. In classical mechanics, the three-body problem consists of determining the trajectories of the motion of three objects in space relative to each other. This problem has no general solution in the form of finite functions for trajectories; only particular solutions are found for certain initial velocities and coordinates. In quantum mechanics, the three-body problem also has no analytical solution. High-precision calculation methods help in solving many fundamental physical problems—in the studies of exotic helium atoms consisting of antiprotons, electrons and the helium nucleus, for instance. They are of particular interest because they allow high-precision measurements of the energy spectrum of this exotic system and compare the theoretical results with those obtained in experiments. Their results will allow researchers to better understand the nature of antimatter and amplify knowledge of the quantum world.